When they are right, they are really right and when they are wrong you're Loverboy. 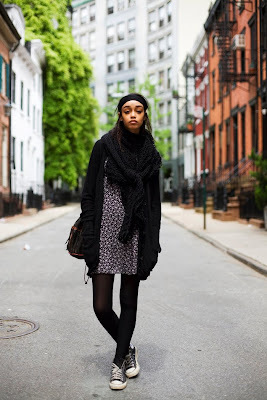 Comments on "On the Street.... Headbands, West Village"
I love everything she's wearing and especially that expression. she's too cool. Loving it... what a natural pose striker~! With Neptune currently transiting humane Aquarius, expect the many as opposed to the few seeking and bringing to bear a very cinematic sense of self, destiny, and style.... expect lots of trends harkening back to that queen of the self-reflexive, the stock Hollywood image. And from all periods. Bottom line? Glamour, glamour, glamour! Illusion, delusion, confusion! With that face, I think this woman could pull off any look! She's fabulous! she's strikingly beautiful. i wonder how old she is, she looks very young, maybe 18, 19, but still has a fierce attitude. She's just plain gorgeous. Again, I love the dress and the beat up Converse... Awesome! Stunner. Who cares about the outfit? (though I do think it's very cool). She's got to be a model... and if she's not, she should be. Way more interesting than so many of the other boring girls you see on the runways and in magazines. Hey that's Bertine a model from Selct Models in London!!!! Used to work with her years ago on a campaign shoot!! I love her whole look - the mix of textures and proportions. The headband serves to highlight her beautiful face. And Hey! - she's not carrying a bag the size of Brazil... Great photo! "...and when they are wrong you're Loverboy." that's possibly the funniest thing i've read on here yet scott. and, of course, spot on. Dang! This youngster knows what she's doing. Ultra cool and cozy in her clothes. Love the Converse sneakers, and you're right--the headband does the trick. While she's definitely beautiful - no denying that...the outfit is common-there isn't anything special about the shoes, purse, sweater or shoes. She's FAB, and so is Scott Schuman for recognizing true FAB. She should date me. She's really, really pretty. She's one long anonymous popsicle until you get to the face. Band, brows and mouth make for a very happy surprise. Glad you caught the shot. It made my morning. The background brought out the whole attitude from her look. /when i first look at this shot, i just love it. but, then when i did zoom in, i thought she looks sleepy and the headband just don't fit in. her face doesn't hurt things. Oh man, headbands are my thing so I'm glad this photo showcases one! I also love her super relaxed pose and the city buildings in the background...it almost looks like the street is deserted, which really adds to the moment that was captured. I like it very much. I've been donning various headbands in odd ways since last year and everyone in my suburbian surroundings seems to look at me strangely, until one day a lovely Brazilian woman said to me, "The way you wear your headbands are very en vogue." That meant a lot. If you ever want to check out my fashion blog, that'd be wonderful. Like the background of this shot.Does she think she's posing for vogue?. She's wearing too much makeup and looks so unnatural. love the attitude in the photo, and she definitely rocks the headband...beautiful! That's Bettine! She's at Muse Models. Homegirl is flyyyy. Completely in agreement with Jorge, the first poster: that background is surreal-- the composition of the three buildings look like a montage from a painting. Love your eye sir! Beautiful girl - and I love the style too. Beautiful image overall Scott. I love this picture, but I still think this outfit would be better without the chucks. They're so done. Everyone needs to put them in the closet for a few years and wear them when they're fresh looking again. Am I the only one who didn't get it? I think the headband makes her forehead look a bit wide and short and creates a strange first impression. The rest is fine. she's a tim burton character come to life! And she's rocking that look because of her tough attitude. Look at that expression! I like her look a lot- she looks pulled together but comfortable and relaxed. And she's got a STANCE! This makes me wish I'd had a daughter (as well as my marvellous, gorgeous son). She's a little intimidating in the face, but chuck taylors can make anyone whimsical. If she chose some sort of lace up patent booties instead of converse, she'd be completely unapproachable. Pretty. This is one of my favorites. A nod to 90's coffee shop chic with the attitude of Keyshia Cole. WTF?! Not much to say about the outfit...she makes it look good with that expression on her face. She is gorgeous but looks like she can't really afford good shoes. Love the outfit. Love the Chucks! Chucks always make the outfit---so hip and cool, just like she is! Oh my, this is so, so halal. She looks fantastic - I am now convinced that sheer tights are the secret to looking great in everything. great pic, great look. long live chucks w/ all types of clothing. i'm with ya on the headband comments. it makes this one. loverboy, ha! get lucky! the main thing for me is not "what" she is wearing, but "as" she is wearing it..cool!